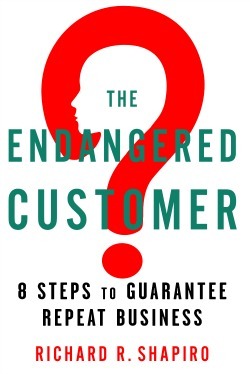 Richard Shapiro’s book The Endangered Customer: Eight Steps to Guarantee Repeat Business is an exclamation point on his three decades of experience in customer service. Learn how to make customers welcome, earn their trust, and surprise them in ways that keep them coming back, again and again. Read it for compelling stories and insightful advice that reminds us customers want to be treated as human beings even in an age where digital service is becoming commonplace. Here are five questions I asked Richard about his new book. Enjoy! 1. Why did you write this book? What do you want readers to learn? The solution or antidote to the endangered customer is to have a proactive strategy to generate a higher percentage of repeat customers. 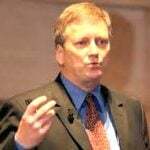 As founder and president of The Center For Client Retention, I have studied data collected during our 28 years in business. The eight steps are a compilation of research detailing what is necessary for companies to do in order to be competitive and perpetuate repeat customers. The steps center around creating, building and maintaining customer relationships long after the initial sale has occurred. 2. Technology is critical for “low effort” experiences that people seem to want. Why, then, do you advocate a “people first” approach to customer experiences? People “love” technology when it enhances the customer experience. They “hate” that same technology when companies use it and don’t allow customers to speak or interact with a human. There is so much information on the Internet that if a customer or potential customer does email or call a company there is a reason. They do not want to be forced into interacting with artificial intelligence. People are human with emotions and when there is an issue they frequently want another human, with emotions, to help. 3. Your book presents 8 steps to increase repeat business. Which one do you find companies struggle most to implement and why? Step six, “Show me I matter” must be executed one customer at a time and must be personalized. Most companies do not understand how to communicate with customers after the sale to demonstrate appreciation and value. That is key to keeping your company front and center. Sending daily electronic promotions are considered junk mail and destroy the customer relationship over time. Find out the customer preferences of text, phone or email and keep in touch with personalized messages that show that your company cares. Write a note and send it snail mail and see the positive impact. The perception of your company will change and help continue the customer experience after a specific transaction or purchase. 4. There’s been a lot of debate about whether “customer delight” is a good idea. Why is “Surprise Me in Good Ways” (step 8) important? There is a difference between delighting a customer at the point of sale and incorporating “customer delight” into a repeat business strategy. The impact of delighting the customer with a free dessert or a promotional coupon as part of the customer experience may diminish quickly. In fact, that might not be necessary if the other components of the customer experience process have been orchestrated – the first four steps: Make me feel welcome, Give me your full attention, Answer more than my question and Know your stuff. However, every business has a percentage of customers who are more loyal or provide the business with higher revenue than the average patron. It’s critical to make the top ten to twenty percent of your customer base feel their importance to your business and are a select group. This category of customers needs to be continually surprised and delighted to feel you recognize them as special. 5. What business do you think does a good job across all 8 steps? I’m often asked which company does the best job of generating repeat customers and following the steps in The Endangered Customer. My answer is that it is a person at a company and not the company itself. It could be Rochelle at Macy’s who knows how to keep in touch, or Iron at Atlantic Grill who tells you when he gives you the check that he is looking forward to seeing you again. It could be Mary at your local neighborhood coffee shop who knows your name, where you live, how you want your coffee prepared and if you don’t show up for a couple of days is concerned for your well-being. The strongest loyalty is person-to-person, not person to company or brand. If your company employs people who can build loyalty one customer at a time and is coupled with an organization or brand that stands behind them, then that is a winning combination. The advantage of the eight steps is that they are a roadmap, follow a logical order and are tied into a human emotion or psychological component. Always remember, customers are people. Adhering to the steps not only makes the customer happy but also helps service providers feel more fulfilled. As Jefferson who worked in Starbucks said, “giving customers that extra smile, asking them about their vacation and complimenting them on their cool shirt, is his way of “paying it forward” and helping society be a better place. 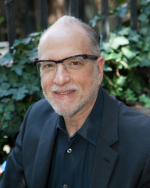 Richard R. Shapiro is Founder and President of The Center For Client Retention (TCFCR) and a leading authority in the area of customer satisfaction and loyalty. For 28 years, Richard has spearheaded the research conducted with thousands of customers from Fortune 100 and 500 companies amassing the ingredients of customer loyalty and what drives repeat business. His first book was The Welcomer Edge: Unlocking the Secrets to Repeat Business and The Endangered Customer: 8 Steps to Guarantee Repeat Business, was released February, 2016.